This special feature for COWBOYS & INDIANS was the most read article of the April 2012 issue. The history is amazing. The impact on the American West's cattle, business, legacy, romance, development, nutrition, and commerce is astounding. Enjoy. Their image defines the Old West. They are as rugged as the land they once roamed and as colorful as the cowboys who worked them. Today, Texas Longhorns are in high demand for many of the same reasons that made them legendary: their gentle nature, varied colorations, resistance to disease, ease of calving, longevity, and ability to thrive in marginal conditions. For both dedicated ranchers and weekend hobbyists, the longhorn serves as a link to the past and a harbinger of the cattle industry’s future, as demand for lean beef and drought-resistant breeds continues to grow. The Texas Longhorn’s history in the Americas began in 1493, when Spanish settlers introduced their domestic cattle to the New World. Gold-seeking Spanish explorers first brought their long-horned Iberian cattle to the Antilles Islands, then, as Spanish conquistadors and priests made their way to the mainland of North America, larger populations of the then-thriving Spanish cattle migrated with them. Modern fence materials had yet to be developed, so the cattle were allowed to forage and run loose. Over time, many were abandoned and left to survive on their own. These new herds of wild cattle underwent an intense process of natural selection as the weaker animals died off. Generations passed and the stray animals grew stronger and hardier, becoming disease resistant and enhancing their ability to defend themselves and their calves from predators with their enlarged horns. By the time of the Mexican-American War in 1846, the Texas Longhorn had become a recognizable breed, distinct from their Iberian ancestors. They were multi­colored and lean, weighing between 800 and 1,500 pounds, and sported a horn spread of up to 5 feet. Texas was the main habitat for the wild long-horned cattle, although they could be found as far west as California. Anglo settlers venturing into the Southwest encountered vast numbers of the feral animals, but it was not until the end of the Civil War that they became an attractive commodity. Returning soldiers found themselves in a cash-poor state with few sources of income, so many began to claim unmarked cattle and brand them as their own. By 1865 there were millions of longhorns roaming free, while the cattle herds in the Eastern states were largely depleted. In 1866, a longhorn steer worth as little as $2 in Texas was worth as much as $50 at the Kansas City railheads. Some enterprising men, like Capt. Charles Schreiner, saw the potential for moving longhorn cattle to Eastern markets. Upon returning to San Antonio after the war, Capt. Schreiner used the money from the sale of his longhorns to buy more than 566,000 acres of Texas land, ultimately acquiring the YO Ranch along with its cattle and distinctive brand. Other trailblazers included Charles Goodnight and Oliver Loving, who partnered up to drive longhorns to market, breaking the Goodnight-Loving trail in the process. Goodnight recognized that his cattle would follow a dominant steer, so when he found such a leader -- a steer named Old Blue -- he brought him back home to head up the next cattle drive. Over the next eight years, Old Blue would lead thousands of cattle north to market. In the evenings, he would often hover around the campfire to be hand-fed by the cowboys. Eventually, Old Blue was retired to Goodnight’s JA Ranch in Palo Duro Canyon, where he lived a pampered life until he died at age 20. In 1867, Abilene, Kansas, became the first cow town and a major railhead for shipments east as cowboys on horseback drove thousands of cattle from Texas to points north in Missouri and Kansas. It could be said that longhorns were the first cash crop of Texas, and the cattle drives became an economical turning point for the region. Savvy drovers soon identified a number of good routes to market, but the work was hard and dangerous. Stampedes, floods, and attacks by roving bands of In­dians were all too common. Despite these hardships, by 1895 more than 10 million head of longhorn cattle had been driven the length of the Chisholm, Goodnight-Loving, and other trails from Texas and neighboring Southern states. During this memorable era, countless longhorn bulls, cows, steers, and calves walked north along well-worn trails and, surprisingly, gained weight as they traveled. The fact that they could not only survive but actually thrive under those conditions was a remarkable testament to the evolutionary advantages these animals had developed. But it was one of their strengths -- their immune system -- that helped contribute to their downfall. By the late 1800s, many ranchers had begun importing “improved” European breeds of cattle, which were beefier and had more fat content than the leaner longhorns. While the immune system of the longhorns gave them a resistance to cattle tick fever, the ticks that traveled north on them wreaked havoc with the more susceptible European breeds. As a result, many locals began to prohibit the passage of longhorn cattle drives across their lands. The loss of marketability coupled with cross-fencing of the open range led the longhorn breed to become virtually extinct within a few years. In 1927, the federal government recognized the importance of preserving the longhorn’s legacy. Since only a few ranches had private herds, Congress appropriated $3,000 to assemble a small number of Texas Longhorns at the Wichita Mountains Wildlife Refuge in southwest Oklahoma. A few years later, J. Frank Dobie, Graves Peeler, and Sid W. Richardson also began gathering a herd to be maintained in Texas state parks. Five other ranchers -- J.G. Phillips, M.P. Wright, Milby Butler, Emil Marks, and Cap Yates -- also dedicated themselves to preserving the breed. Their resulting herds, along with the Wichita Refuge herd and Peeler’s herd, would become known as the seven original families of longhorns. 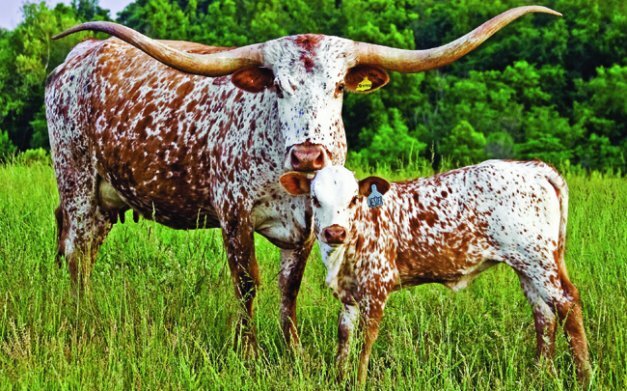 The Texas Longhorns assembled by these early cattlemen were distinctly different from each other, with variations ranging from horn length and shape to body conformation and size, according to the traits most admired by each of the men. Following in his grandfather’s footsteps, Charles Schreiner III helped establish the first longhorn registry in 1964 to preserve breeding records. 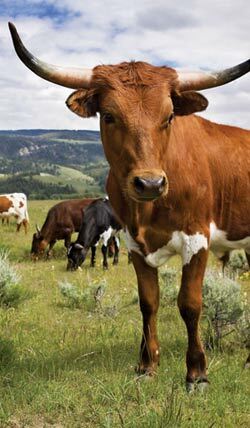 Today, herds of Texas Longhorns can be found in all 50 states and throughout North and South America, Australia, and even Africa, where they are being used to upgrade existing cattle breeds. Transported in small leaky ships across the stormy Atlantic, left to run wild in the harsh American Southwest, driven thousands of miles along the cattle trails, and ultimately saved from the brink of extinction, these magnificent cattle flourish today, providing enjoyment and financial reward to thousands of owners worldwide. A symbol of survival, the Texas Longhorn will continue to be a beloved icon of American heritage for generations to come. 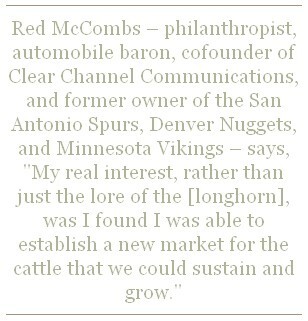 Wes Chancey is the CEO of the Texas Longhorn Marketing Alliance. To learn more about Texas Longhorns, visit Cattlemen’s Texas Longhorn Registry, www.ctlr.org; International Texas Longhorn Association, 254.898.0157, www.itla.com; Texas Longhorn Breeders Association of America, 817.625.6241, www.tlbaa.org; and Texas Longhorn Marketing Alliance, 512.556.0300, www.thelonghornalliance.com.